On February 28th 2017 the second level court hearing against ten of the Röszke 11 – all but Ahmed H., who was sentenced to ten years of prison in a separate trial – was held in Szeged. The only person remaining in Hungarian custody and therefore present at the court hearing was Yamen A. The other nine people have left Hungary some month ago and claimed asylum in other European countries. Albeit two of them left Europe under the “voluntary return” act due to the immense pressure imposed on them and the threat to deport them back to Hungary under the Dublin Regulation. The second level hearing was merely a revision of the first instance verdict, although some defence lawyers of the ten Röszke accused appealed against the whole first instance trial, stating it had been full of flaws and that witnesses and evidence relevant to the cases had been rejected at first instance, and further that the verdict had barely contained a precise “description” of what the accused had actually committed. However, the second level judge endorsed the verdict of the first instance concerning the nine people who had already left Hungary and excluded any chance for a redress. The nine affected apart from Yamen and Ahmed, who each had a year of their lives taken away (some even 14 months) by the Hungarian state, will not be considered for redemption. The systemic racism behind this denial of fundamental rights to refugees is salient. 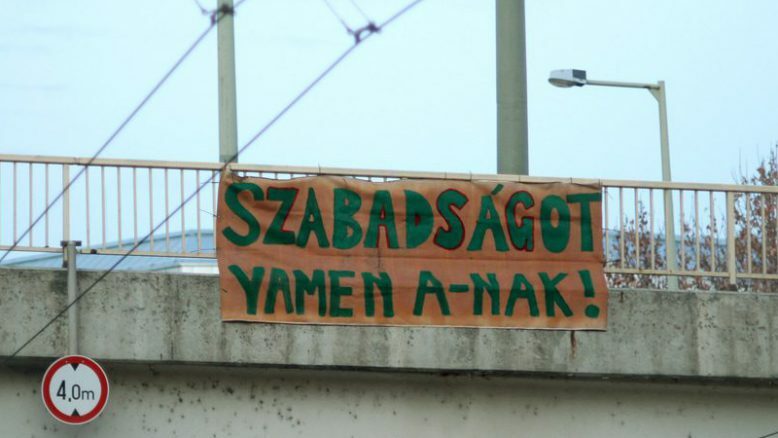 This means that in Hungary, the simple presence (the “supportive attendance”, as the judge put it), of people seeking international protection at the Röszke border crossing on the 16th of September 2015 – of the elderly, half blind women, of G. in his wheelchair, of F. on crouches, of K. holding his little daughters – is being punished with an at least one-year prison sentence. Yamen had received a three years prison sentence in the first instance in 2016, as he was recognised speaking through a loudspeaker to the crowd. The judge detected some minor flaws in his prior verdict. However, evidence that had been translated wrongfully in the first instance and used against Yamen was not revised. Although the lawyer asked for a precise re-translation and revision of important key-evidence, the judge dismissed this request, claiming that the court had no doubt of Yamen being the “leader of the mass riot”. The bare fact of him using a megaphone was sufficient prove. Nonetheless, the judge reduced Yamen’s sentence form three years to two years in prison. He did not give a clear explanation apart from adjusting his punishment to the ones of the other nine accused. The reduction to a two years sentence means that Yamen can be released on prohibition now, as he already served 2/3rd of this sentence. Yet this remains up to the authorities to grant. Further, there is the fear that he may be detained again and deported to Serbia; despite Yamen having claimed asylum in prison and in front of the judge again. Another fear is that Yaman will be put in a closed asylum detention camp. The Hungarian state announced that they plan changes in asylum law, which would mean that all asylum seekers get detained at the Serbian border until their asylum claim is fully processed. This rule is not yet in practice, but the systematic detaining of asylum seekers is already a common practice of the Hungarian state. On the evening after the verdict, activists of the “Free the Röszke 11” campaign put the Hungarian state on a public trail in the streets of Budapest. Unlike in the in Szeged courtroom, on Mikszáth Kálmán Tér in Budapest video evidence and witnesses statements by the accused as well as by journalists and lawyers were permitted. People gathered on the square around 6.30pm and with the words: “In the name of the people, we have gathered to proclaim the final verdict against the accused Hungarian state, charged with terrorism and other racist crimes!” the judge opened the public hearing. “The accused party, the Hungarian state, is led since 2010 by the fanatic Fidesz sect, which uses corruption and brute force to devastate the social, economical and political fabric of the Hungarian society” the judge continued. Thereafter, video footage of the demonstration at the Röszke border crossing was screened. Thereby, it could be seen that it was the Hungarian police that attacked the refugees. Further, testimonies of the accused where heard and the inhumane treatment they endured at the hands of the Hungarian authorities became evident. To illustrate that these were not singular cases, but that the Hungarian state up to this very day systematically mistreats refugees, a testimony of a refugee who was caught close to the Serbian border was read. The violence people who are caught in Hungary without papers endure on daily bases appeared to be horrendous. “According to testimonies, according to the evidences, it is obvious that the trials and treatment of the Röszke 11, the violence at the border and the oppression of citizens were a conscious crime.” The judge declared. “It is to be held accountable because in full consciousness it continues with the show-trials, the imprisonments, the violence at the border, the repression of democracy.” Therefore, the judge declared the Hungarian state to be guilty of terrorism. We demand the immediate release of Yaman A. and Ahmed H.! ← Zurück Vorhergehender Beitrag: Update: Freedom for Mahmoud A.